Archaeologists in Egypt have uncovered four unique child graves at Gebel el-Silsila—the site of a former Egyptian quarry that dates back some 3,500 years. The discovery is shedding new light on what life was like at this ancient work site, and the complex social hierarchy that likely existed. The Gebel el-Silsila quarry dates back to the Thutmosid period of ancient Egypt, running from the time of Thutmose II (1493 BC) to the reign of Amenhotep II (1401 BC). Back then, the site was an important source of stone for temples and tombs in Upper Egypt, and it was more than just a place to work—it housed an entire community, and a vibrant, dynamic one at that. Since 2015, nearly 70 tombs have been uncovered at the site, reports Live Science. The latest discovery, announced this week by Mostafa Waziry, the Secretary-General of the supreme Council of Antiquities in Egypt, includes four child burials, along with crypts and chambers. The child burials are the first of their kind to be found at the site, containing children under the age of 10 and various burial artifacts. The discovery was made by Maria Nilsson and John Ward of Lund University in Sweden. Each of the four child graves had a story to tell. Of them, the best preserved belonged to a child between the age of six and nine. Buried in a badly worn wooden sarcophagus that was partially sealed with mud, the child skeleton was found with burial goods such as intact beer jars, wine vessels, plates, and bowls. The archaeologists also found a bronze razor, four scarabs, or bracelets, attached to the child’s wrist, and a “nefer” amulet on the chest—a symbol of happiness and good luck. The amulet was likely relocated from its original location by beetles, who also did a number on the coffin. 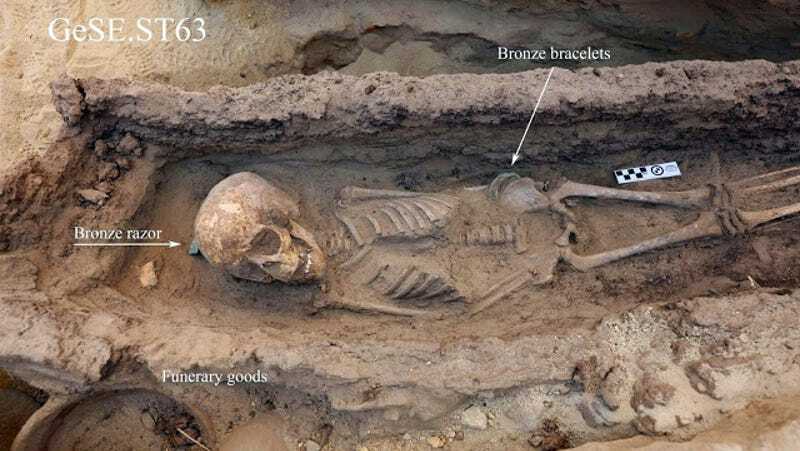 Clearly, a lot of thought, effort, and resources went into this burial. A skeleton from a child who died between age five and eight was also found with grave goods, including a scarab bearing the name of the Thutmosid period and a ceramic vessel. At another grave in a rock-cut crypt, the skeleton of a very young child, around the age of two or three, was found wrapped in linen. The small skeleton was covered in organic material, likely the termite-munched remnants of a coffin. The grave also featured a limestone lid, once preserved in plaster, that had crumbled away. No cause of death was detected by the archaeologists, nor did they find any burial objects. Not the most spectacular grave, but someone clearly cared for this child, burying them accordingly. The fourth grave told a much different story. A child between the age of five and eight was buried unceremoniously in a quarried work area, and covered with quarry debris. Nilsson and Ward said this grave couldn’t be connected with the others, but a preliminary pathological analysis of the skeleton suggests the child had been battling some kind of illness. More work is required to better understand this particularly grim burial scene. The archaeologists also discovered several new crypts and burial chambers, many of which had been looted long ago. Items found included bones, ceramic vessels, jewelry, textile, and wood. The diverse nature of the child graves suggests a social and/or economic hierarchy existed at the Gebel el-Silsila quarry, with some deceased children receiving more lavish burials than others. The archaeologists would like to know why there was such a discrepancy in the funerary styles, and the types of people who lived and worked at the site. This discovery also suggests that the quarry housed a socially dynamic and vibrant community, and that it was much more than a just a place for slaves and workers to toil. So in addition to providing important new insights into the funeral and burial customs of the time, the site is telling us a bit more about social and economic organization during the Thutmosid period, and that individuals and entire families were involved with quarry work.